Take 1/2 stick of butter, softened, and mix well with the peeled, chopped garlic, the chopped herbs, and the lemon zest. Form into a log and refrigerate. Generously season the filet's with salt and pepper, approximately 1 teaspoon of seasoning per side. Heat the remainder of the butter (1/2 stick) and the olive oil in a cast iron skillet to a screaming hot temperature. Sear the filets in a screaming hot pan for about 2-3 minutes per side, or until a nice brown crust has formed. While the steak is searing, continue to spoon the residual butter in the pan on top of the meat while it's cooking. Once both sides are seared, place in the center of the oven for about 6-8 minutes, depending upon how thick your steak is. In the last minute of cooking, take the log of compound butter and slice a nice thick piece to place on top. Your steak will be ready when it is approximately 135 degrees in the center, or when you push lightly on the top center of the steak and it gently and slowly bounces back. Note: We didn't make the garlic/herb butter. 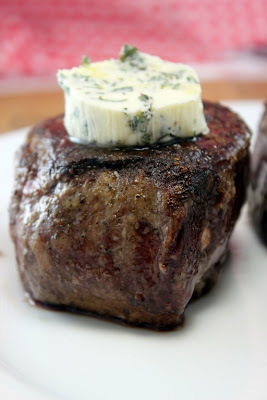 We seared our steaks and continually coated them in butter but decided to top ours with fresh blue cheese instead.